I had difficulty falling asleep on Saturday evening. The events of the day, winning the single, Romana winning the eight, the Masters Party, combined with the hot hotel room without airconditioning, and a few beers, made it hard to fall asleep. So I watched some German TV. Then I dozed off. The best thing about our hotel in Dachau was the breakfast. There was a huge choice of fresh pastry, fruit, eggs prepared in different ways, and as we discovered, on Sundays there was free Champagne. Not for us. We still had one row to row. The weather had turned 180 degrees. From sunny and hot to rainy and gray. Temperatures had dropped to 17 degrees C, from above 30 the day before. We cycled to the race venue, about a 30 minute ride, which we felt was a very nice way to start the body and prepare it for racing. We arrived just in time, before the rain started. 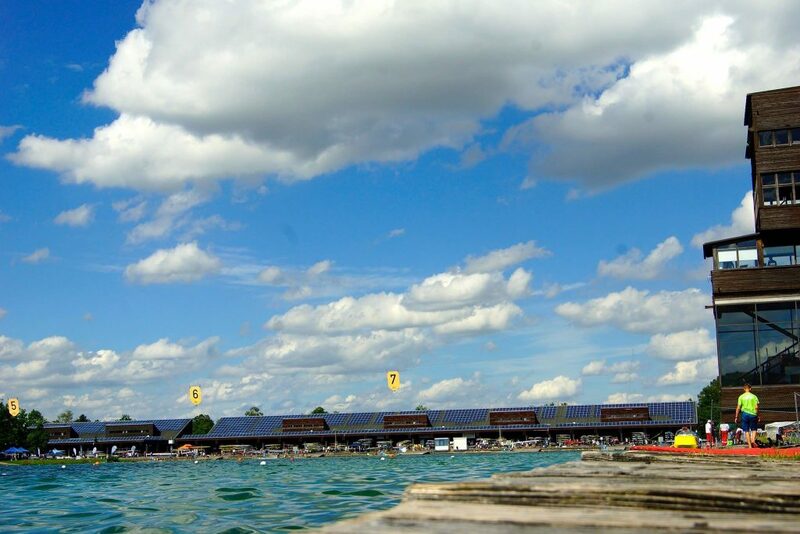 The boats area was quite empty, with only the boats of the participants to the singles finals (Munich Trophy) and the mixed events left. We watched the singles finals (with mixed feelings), then went to the Salani booth to pick up our club’s new youth single. 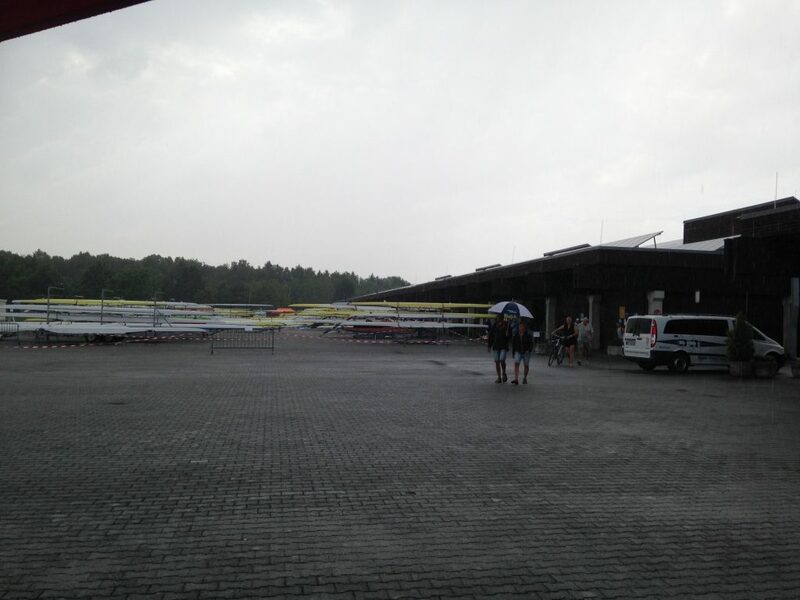 After that, it was time to prepare for our race, the mixed C 2x. 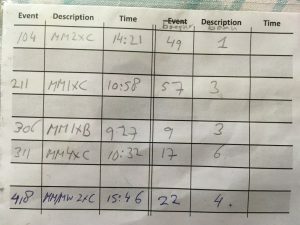 The mixed races were open for registration until Saturday afternoon, and apparently the event organizers were a little exhausted when they compiled the start list. Even though we had registered only for the C event, we featured on the starting list of the A event as well. 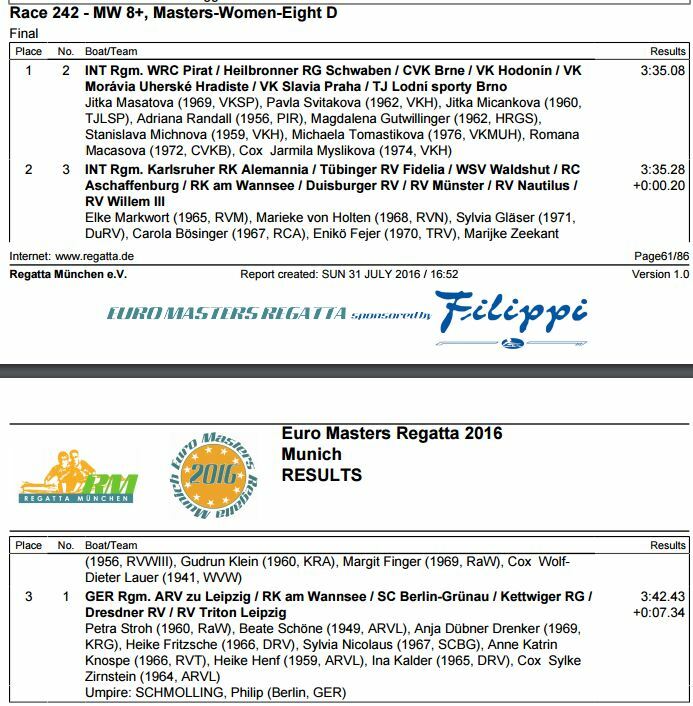 Our friends Martin and Jitka were listed on two heats of the mixed C 2x. At the pre-start, called our race exactly when we arrived. 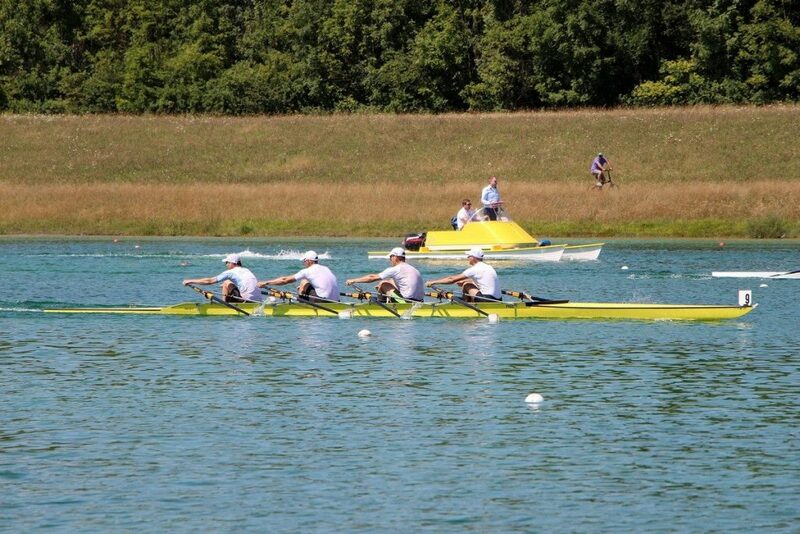 We found that strange, because at the start there were quads preparing, and we were the fourth heat in the Mix C 2x. 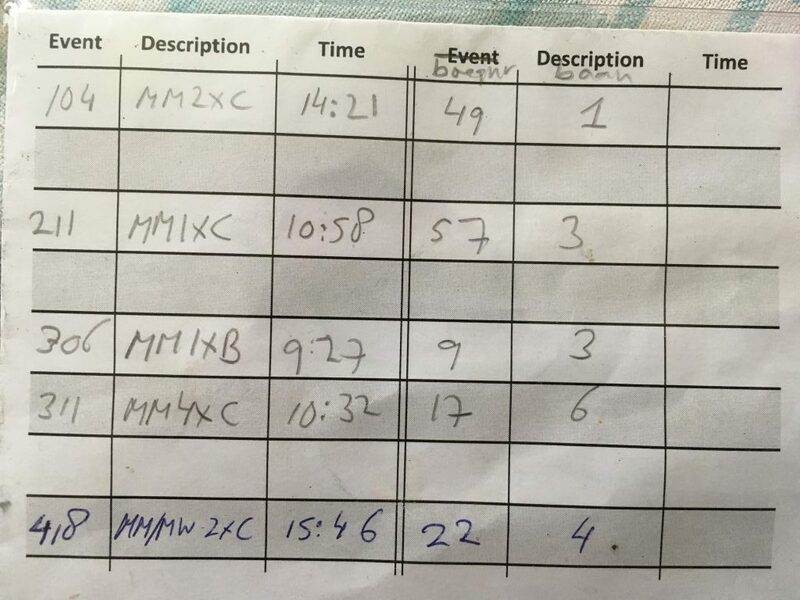 It turned out that two pages of his list had stuck together because of the rain, and he skipped three heats. When he discovered that, there was a lot of confusion, and some of the crews of the first three heats were quite far away, which caused substantial delays. Our friends Martin and Jitka got started in their second heat. Then some time was spent calling for them during the third heat. In the end it was decided they weren’t there and their heat was started without them. Then it was time for our race, which was reduced to a race between three boats, I guess also due to double bookings. There was a French couple with which we had had chatted at the pre-start. I had translated the confused German and English announcements into broken French. Then there was a German couple from Hersfelder Ruderclub. 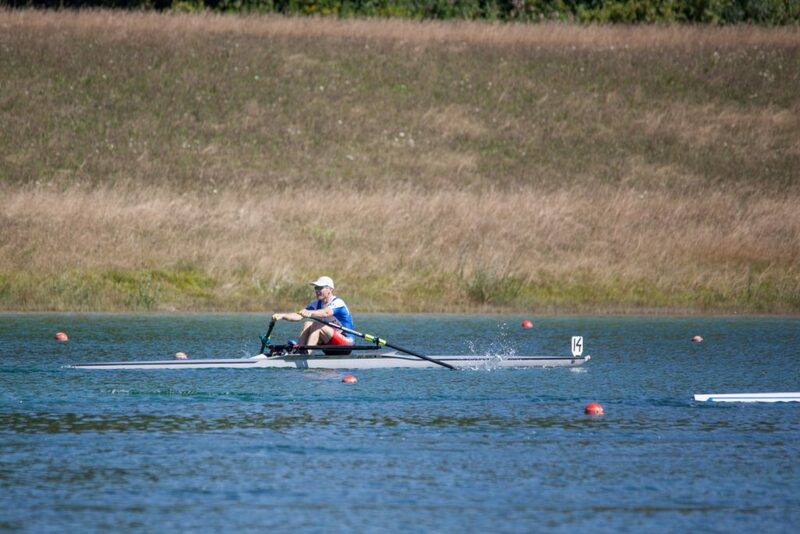 I knew Andreas, the guy at stroke, because we had rowed a quad together at Masters Worlds in Duisburg, in 2012. I also knew he was fresh. He hadn’t started a single race during the weekend. Anyway, there was not a lot of time to think about it. We were in the starting pontoons and the starter was calling us. We started off well and quickly gained … nothing. When I peaked to the side after then strokes, there were three boats in a line. The French maybe a bit behind, and the Germans perhaps half a boat length in front. 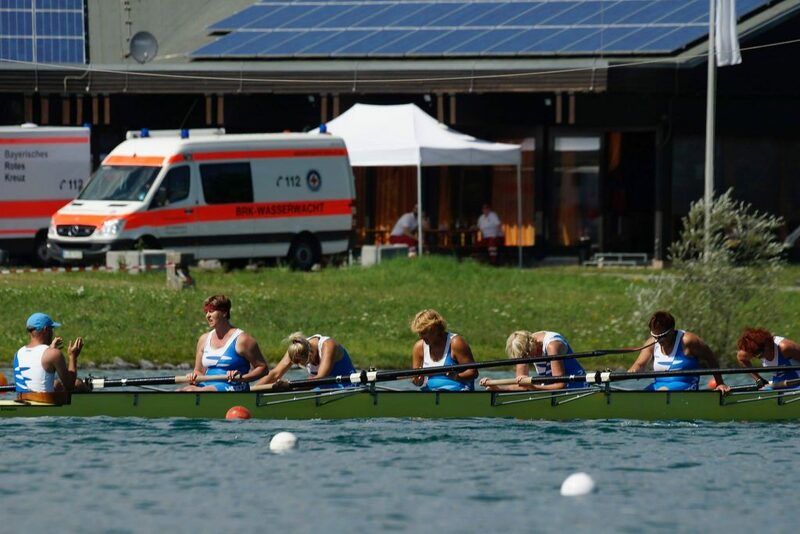 In the next 10 strokes the Germans rowed away. When they had a length on us, we managed to stop this. Well, you have to be patient, right? 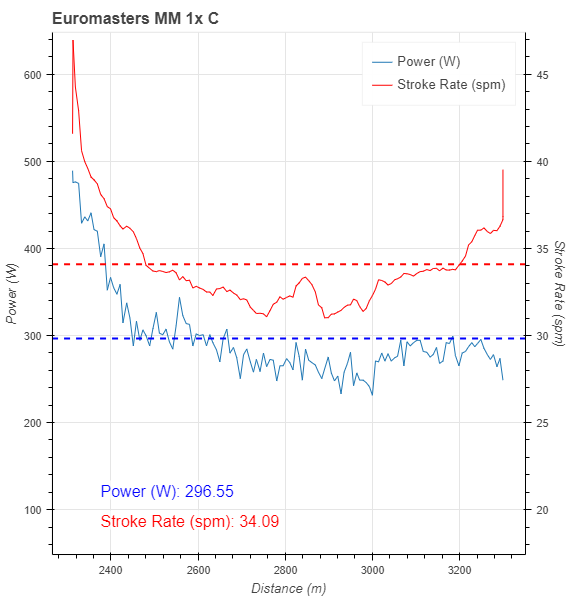 Just after passing the 750m line I called for a 15 stroke push. We were a length behind the Germans and the French were half a boat length behind us. We took half a length back on the Germans, but the French were still on our heels. In the next 300m nothing really happened. Except that everything started to hurt. Then I took up the rate again and I think we came level with the Germans. But I am not sure and have to rely on reports from people on the shore. With 250m to go I didn’t have to call for a sprint. Romana knew. We took the rate up a little. 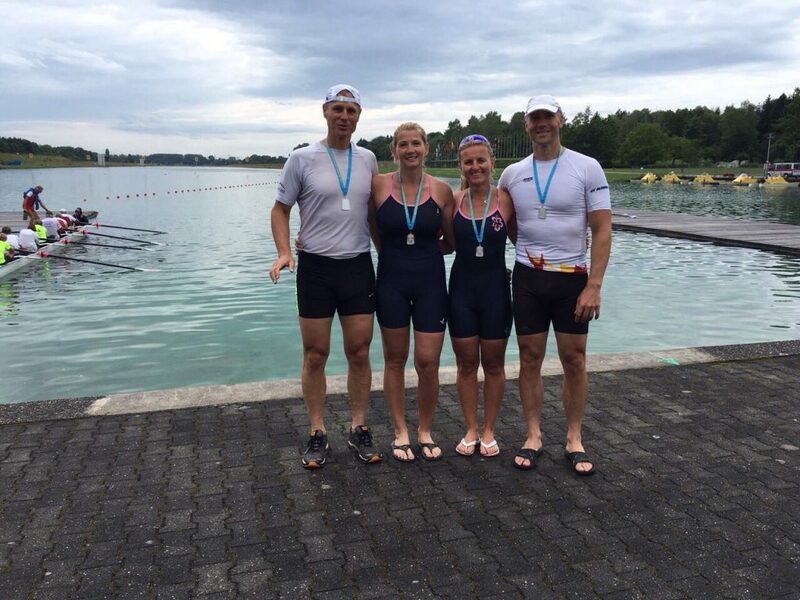 According to the post race reports from people on the shore, we came level with the Germans. The French started a furious sprint. We responded. The Germans responded. There were just 10 to 15 strokes left to the finish. I don’t know how many. I only remember I moaned and tried to increase the rate even more. I felt how Romana was pushing with every stroke. After the finish, we only knew that the French were last. I didn’t have a good feeling, but when Andreas asked me who won, I answered I didn’t know, and proposed to row to the Finish Tower and ask. We did a 1km cooling down, then loaded the double on the trailer, went for a quick lunch and then it was time to hit the road. The first 30 km from Munich we drove in very heavy traffic and didn’t move a lot. 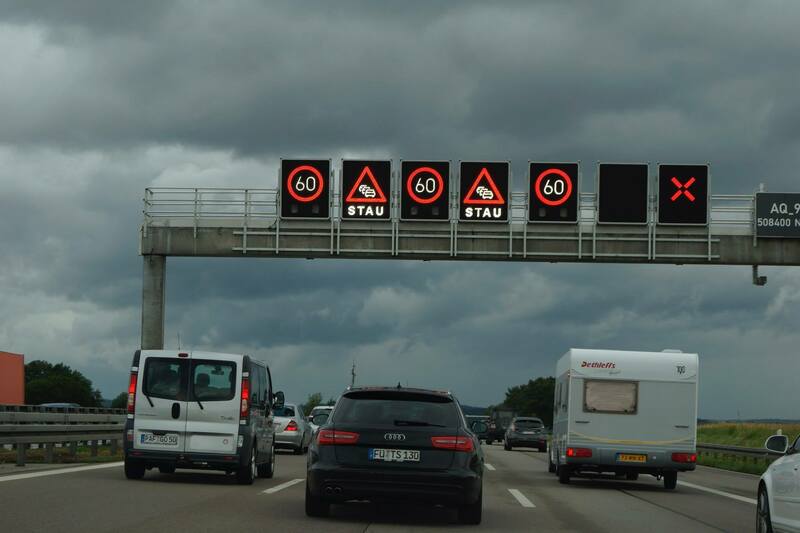 Then we finally took the highway towards Berlin/Prague, which was quieter. At that moment, however, it started to rain heavily, and we couldn’t go any faster than 80km, driving our trailer through hilly country on a very wet road with very low visibility. 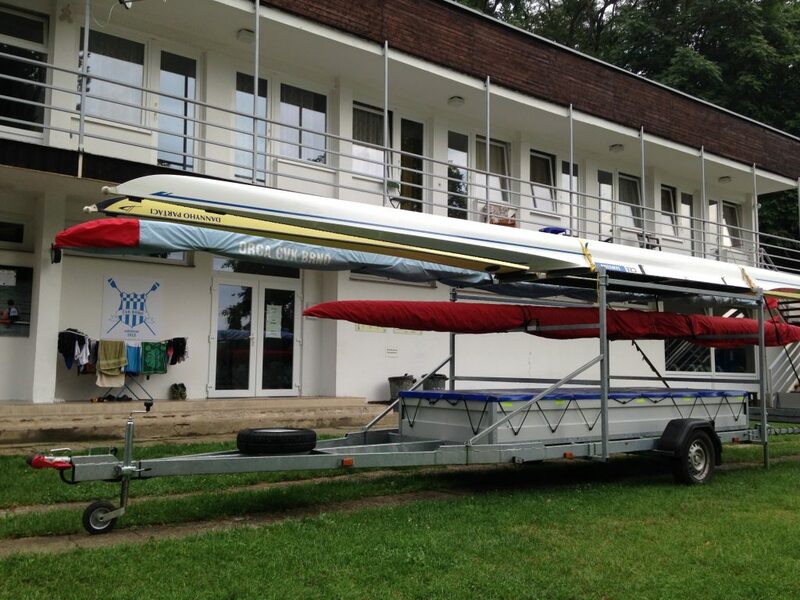 Made to to Prague by 7pm, where we offloaded two boats at rowing club Blesk, then continued for Brno. We were at our local rowing club at 10pm. We disconnected the trailer and drove home. Tired. But happy. Although we were still contemplating if we could have dug a little deeper and perhaps won even the mixed double. 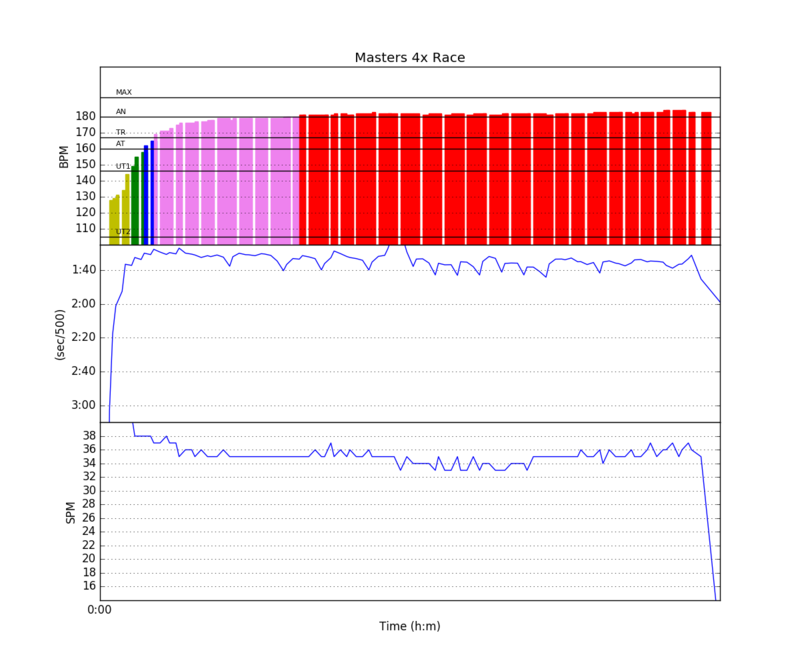 My race was at 10:41 so almost copy-paste from Friday in terms of race preparation. The only difference was that this was going to be a very hot day. I sweated a lot during the warming up run and I drank a lot of Isostar to remain well hydrated. The procedure would be the same. 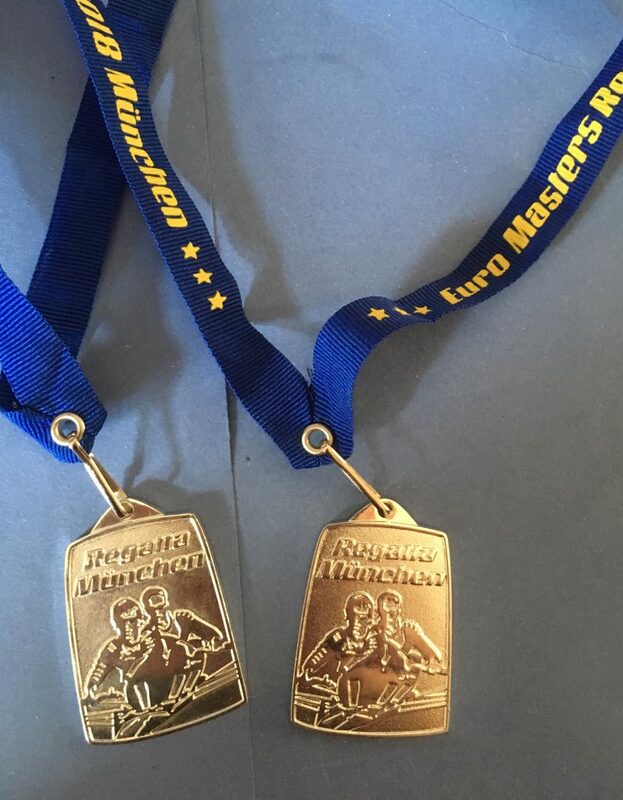 Each heat winner would get a medal and be able to call himself “Winner at Euromasters 2016” and the heat winners would automatically qualify for the “Munich Trophy” races on Sunday. In case of less than 6 heats, the open lanes would be filled with the fastest non-winners from the heat, in order of finish time. 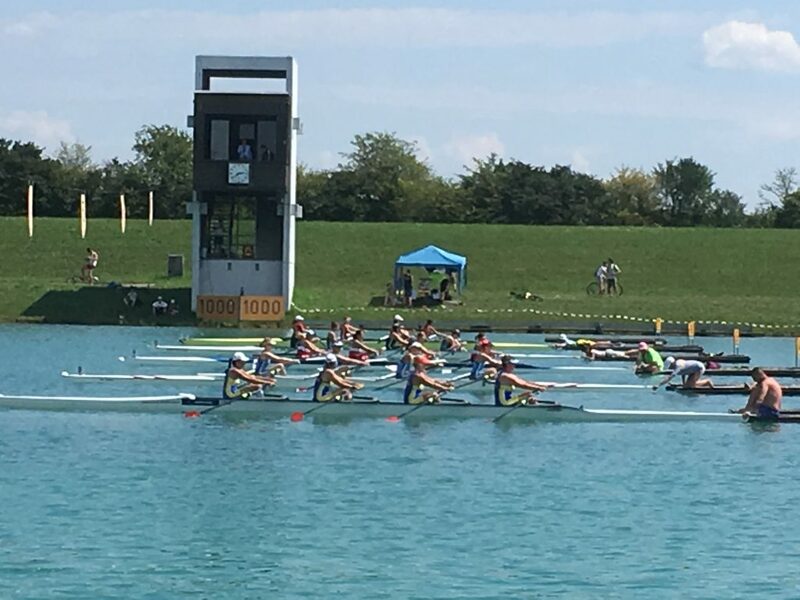 In case a rower qualifies in more than one age category, he would have to row in his own age category, and his open place would be filled with the next fastest rower, etc. I like the concept, but there is a caveat. More about that later. 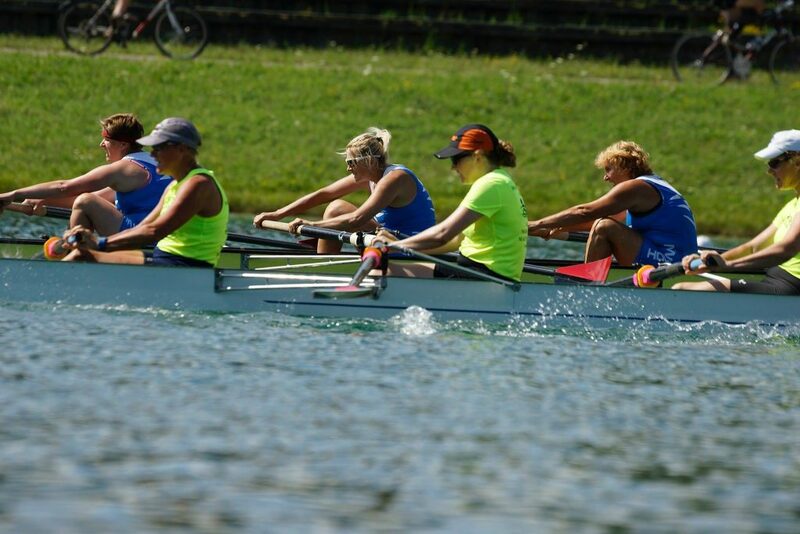 The heats were organized by age, so I ended up in one of the earlier heats with a mix of C and true B single scullers. I didn’t know any of the other participants. I would find out at the start. I decided to launch late because of the heat, so the warming up was relatively short. I rowed to the start, then continued for another 750m, turned around, did a practice start, and then paddled to the pre-start. 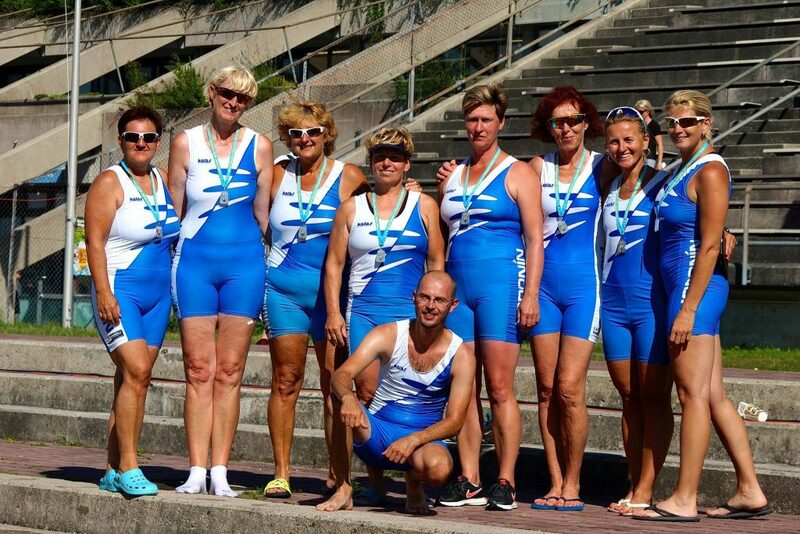 Two Croatian rowers were missing from the race scheduled before me, so they decided to let my heat start before that one. So suddenly I was in the starting pontoon. Which was good, actually, because backing up into the starting pontoon is when my nerves usually start to calm down. To my right was an Italian guy who looked beatable. To my left was a German guy who I noticed had some difficulty backing up into the starting pontoon. Then in lane four a broad-shouldered, big German guy. And in lane 5 an Italian guy. Romana was on the bike path on her bike. With a few German guys who were supporting Lane 4 (Sebastian Gobel). Romana later told me that they apparently were confident their guy would win and they were making fun of the skinny Czech/Dutch guy in lane 2 (me). I believe her. You don’t have to believe her, but it’s a good story. 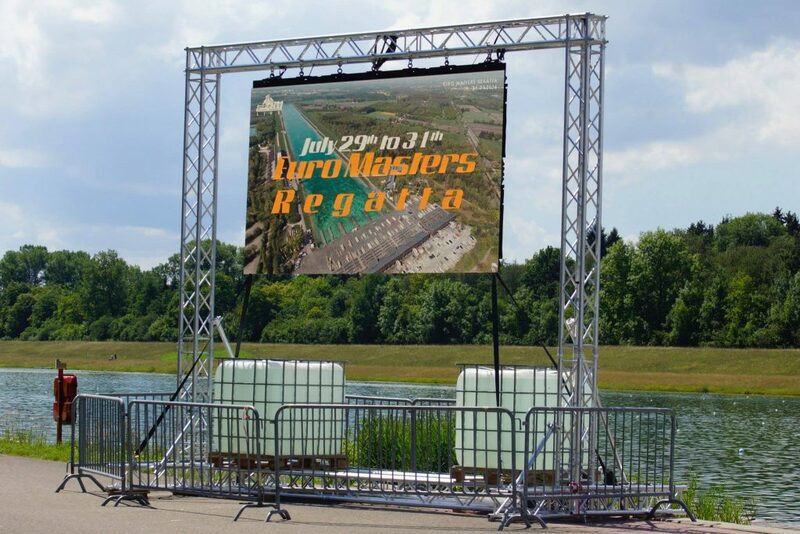 This time I was prepared for the starting routine, so when they started to call out the lanes, I mentally put the volume of the starter’s words lower and increased the signal in the visual channel: I watched him grab his flag, raise it, and I shot out of the starting pontoon. Practicing starts really helps. Start strokes. Then 10 power strokes. Then check position in field. Picture taken immediately after the start. I am in lane 2 on the opposite side. You can see the bow of lane 1. The German guy in lane 4, with bow nr 16, was the favorite. Another picture taken immediately after the start. The other guy is not in front of me. The perspective is misleading. I was out in front. On my own. There was light between me and Lane 4. That, I thought, is quite a good position to win. 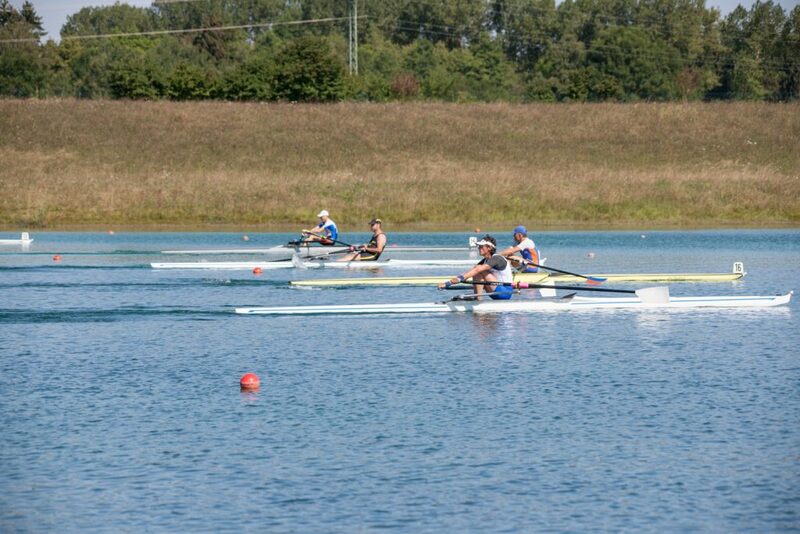 With 900m to go, I thought, that is a lot of strokes left to spoil a perfect opportunity. 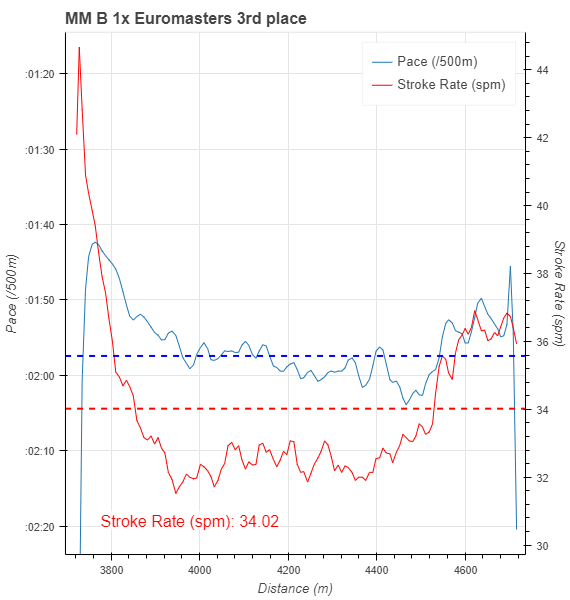 Not sure whether to go to race pace directly or to continue at a slightly higher pace and build out the lead. I decided to do something in between. Focus on technique. Ten strokes on length. Ten strokes on a good tap down. Ten strokes on rhythm. That brought me to the 500m mark and I was in a comfortable lead. There was more than enough light between me and Lane 4, and the rest of the field was not a threat any more. Romana shouted to watch out for lane 4. I knew that. He was pushing. 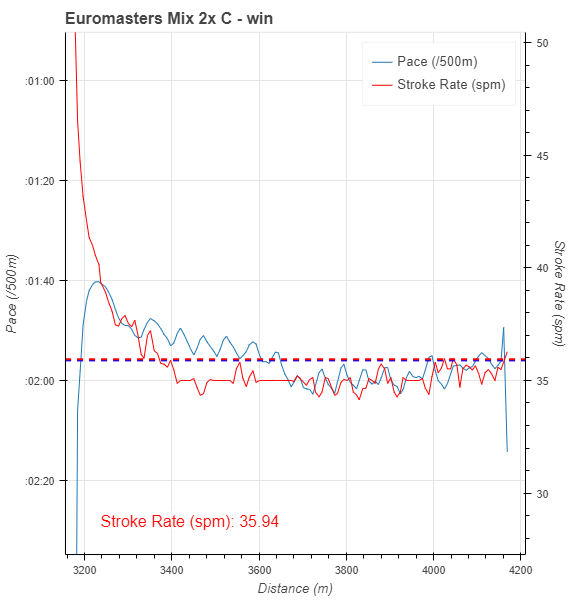 Instead of my usual push I let the stroke rate drop to 30spm to save energy, see what the Lane 4’s push would do to our relative positions and then respond. Our relative positions didn’t change. In a 1000m race, the third 250m is always the hardest one. But this time I was in a comfortable position that I could stay calm, push away at 30spm and survive the lactate rush relatively easy. 250m to go. The shadow of the grand stand. I took up the rate a bit, mainly for my fans, and also hoping to increase the gap a bit. I wanted the race to be over. And at the same time I wanted the moment to last forever. I saw the finish tower in my peripheral vision. A few strokes. I heard the speaker say my name. Very happy. German guy in lane 4 came second, 10 seconds behind me. We both waited for the rest of the field to finish. I paddled to the finish tower, got my medal, and enjoyed a 1000m cooling down. Lots of pictures were taken (which I will publish later when I get them by email), and congratulations received. 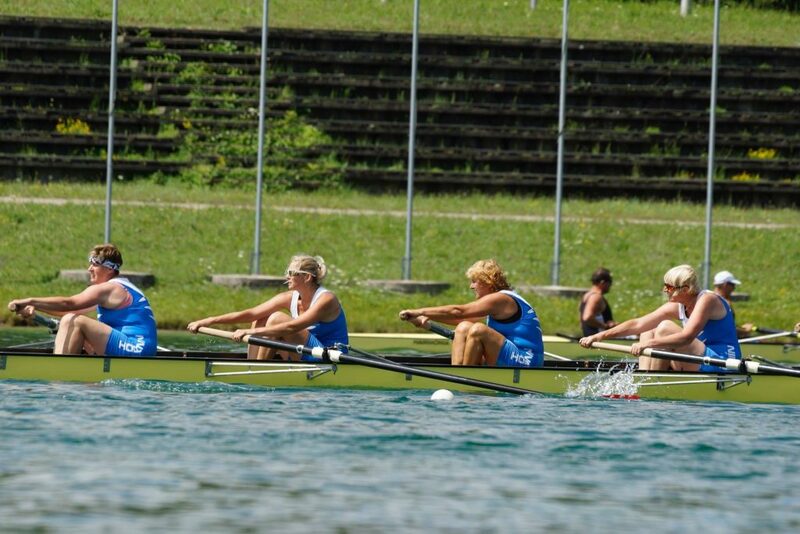 Also, I had qualified for the Munich Trophy, to be rowed at 9:20 AM on Sunday. Checking the times, I would be among the three slower boats in that race, and I wondered if it was worth rowing this race, knowing that I wanted to row well in the mix double a few hours later on Sunday. Later that Saturday afternoon I went to the finish tower and officially withdrew from the race. I had prioritized the mixed row with Romana. 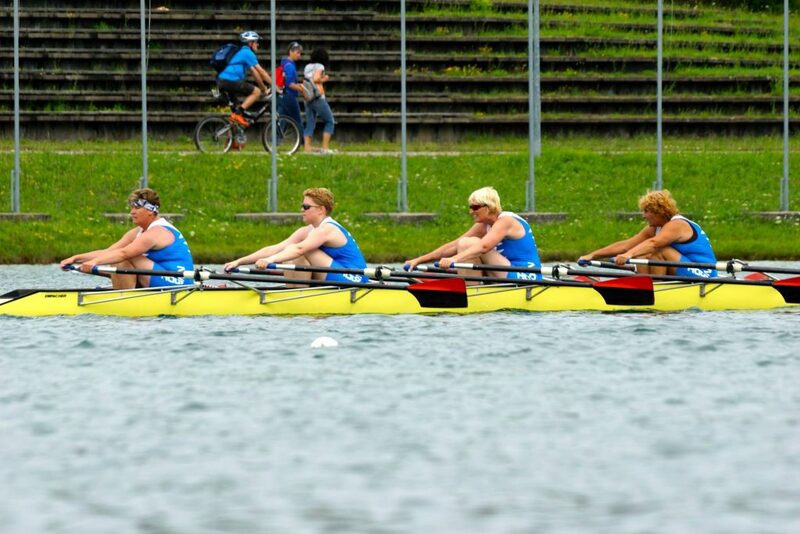 Only two hours after the singles race, I stroked an ad hoc quad with two other Czech Rowers (the guys in below picture) and a Slovak guy from Piest’any. I guess we were a true Czechoslovak team. Even though our age was C (43 and older), due to our late registration we had to compete in the A category. We also had some difficulty complying with the “uniform clothing rule”. We decided for black shorts and white shirts. I wore my club shirt inside out (sort of white) over my black/red training uni. Two of my quad partners. 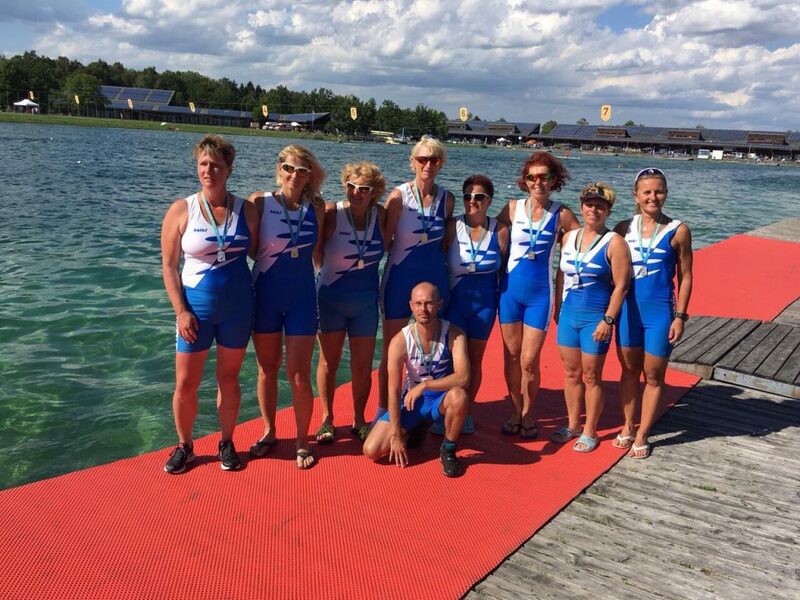 Picture was taken after the mixed quad race on Sunday, which they won. The Italian crew next to us got an official warning for not being uniformly clothed, and I kind of expected to get a warning as well, but we passed. We rowed well, but two German boats were much too fast for us. We had some nice racing for the third place with the Italian crew. Romana and her eight won the D category in a three boat race that turned out to be a thriller. The final strokes. The very last stroke decided this race. In the evening, Romana and I took the double for a quick row. Just 4km to check the boat. Then we took a shower and dressed up for the Masters Party. Dancing to a Bavarian live band and mediocre food, and beer, what could you wish more! Good food perhaps. The beer was excellent though. Thunderstorms in the distance while we cycled home. Frank Arnold from Germany had withdrawn. So this bunch was the four youngest participants in the C category. At Euromasters, the singles categories race as follows. Each winner of a heat gets a medal and proceeds to the final. If there are fewer than six heats, the next fastest times qualify for a final as well. 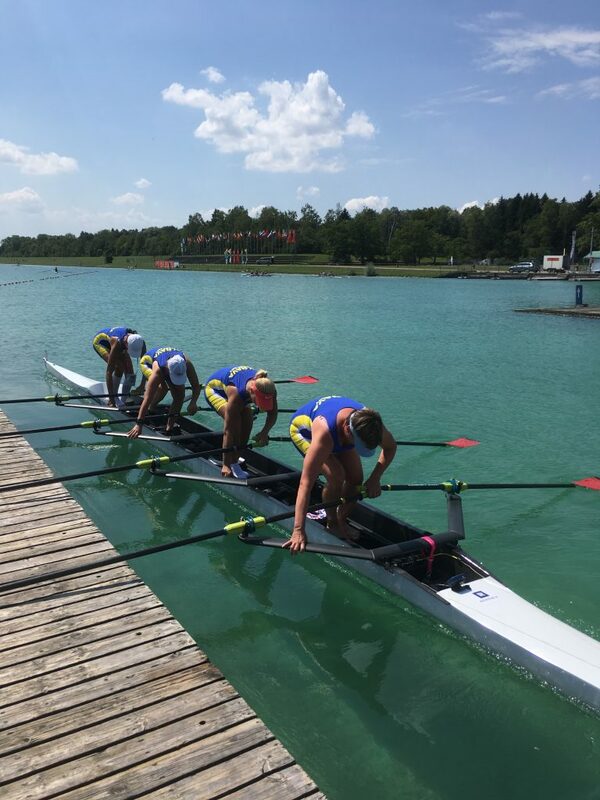 If a rower qualifies in more than one age category, he will row the final in his age category, and for the other age category the next fastest time will be selected, so there was an incentive to row fast whatever your position in the field. 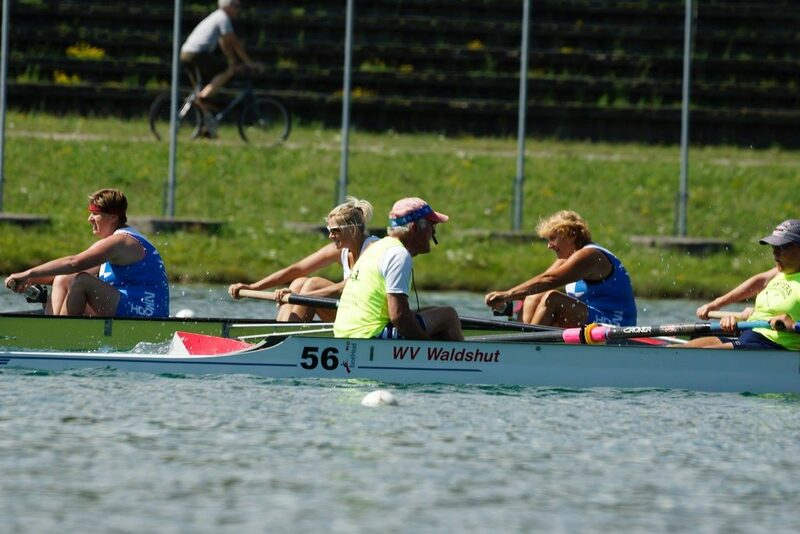 The finals (one for each age category) for the “Munich Trophy” would be rowed on Sunday morning, before the Mixed events, and the winner would get the Munich Trophy. The nrs 2 and 3 in the final would get a medal. After my usual warming up routine I found myself at the pre-start with Petr and the rest of the field. Petr and I started chatting (and got reprimanded for being too noisy). Then it was time to row. GO! Red flag down. We were off. 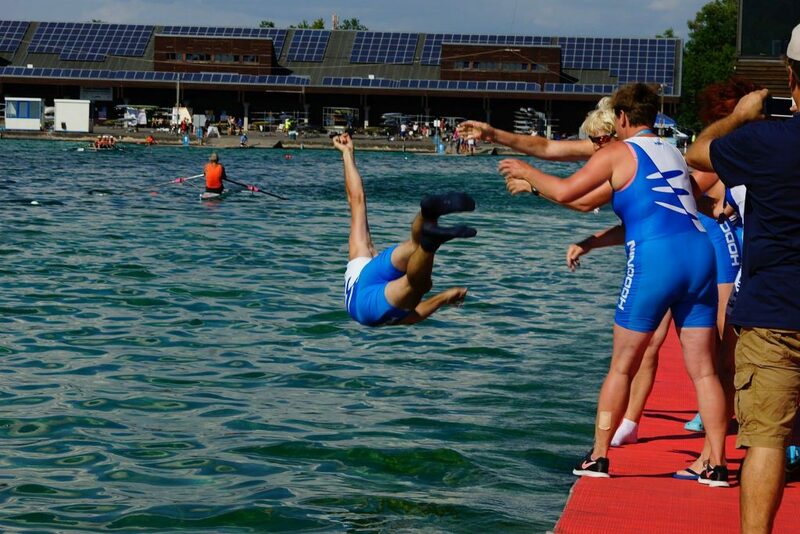 Here is a picture of Petr (the guy in blue in the background) and myself doing our first stroke. Ready – Attention – Go! Despite the almost false start, my real start was an excellent one. By the 5th stroke I was leading by a length, with Petr in second position. 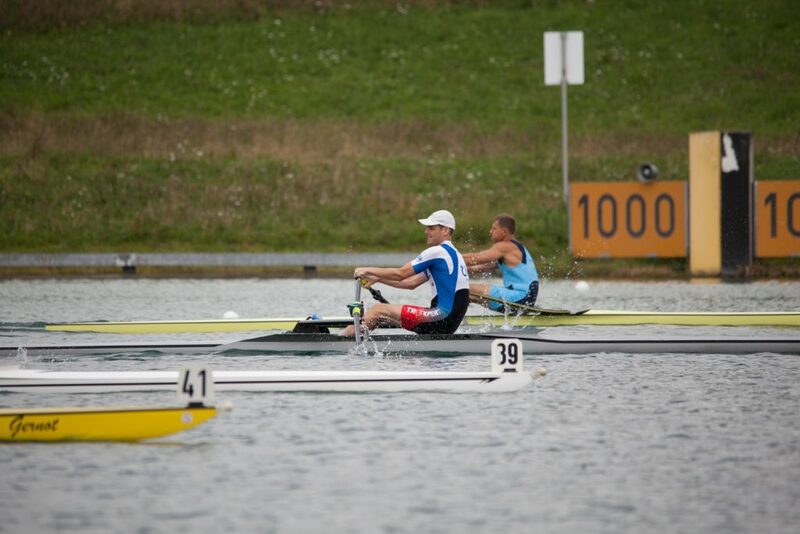 I managed to stay ahead of Petr in the first 250m, but the distance between us became smaller with every stroke. With 750m to go he passed me. Given my previous race experience with this guy, I decided to stick to my race plan and race for time, as well as defend the second place. It shows better how the race evolved. I started very fast and then gradually dropped to my race pace as Petr was passing me. 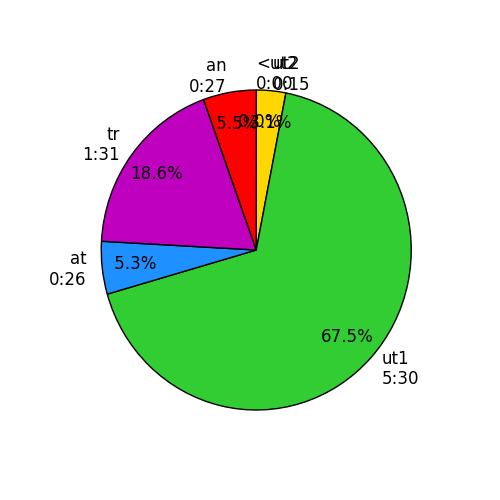 The 4.4 m/s of the second half of the race corresponds to a 1:53 pace. I pretty much rowed this out in a flat pace, keeping an eye on the German guy. 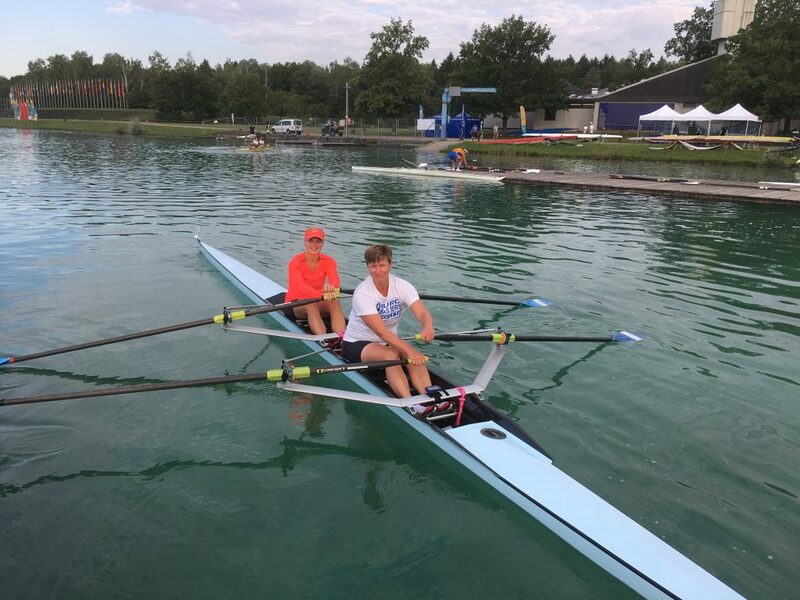 While rowing in front of the grandstand (which is a full 250m long), I noticed a few 1:58 splits on the SpeedCoach, which motivated me to try and speed up a bit. In the end I was just 4 seconds behind Petr. As this was all my racing for the day, I had the afternoon free to enjoy watching Romana racing, browsing through the merchandise, have a beer, and chat with various people. Romana was racing an eight and a quad, both races in a younger field than her crew’s age category. They finished last in both races but they took it as a good rehearsal for the Saturday races. Regarding the photos, I am reproducing the excellent pictures taken by Natascha Kral and the race pictures that I purchased from the official race photographer Patrick Frost. Only the lower quality pictures taken with a phone are my own. In the evening I did a quick training in an ad hoc quad that we registered on Thursday afternoon. 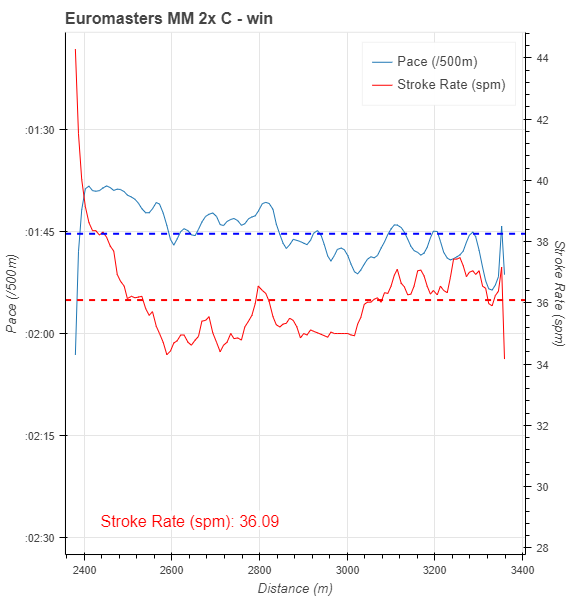 With the high price for late registration, we counted that we would pay 1,50 EURO for each stroke during the race, and although we were age category C they would only let us start in the A category. Still it was attractive enough and the race was on Saturday after my B singles race, so no clashes with high priority races. Then Romana and I cycled to Dachau. We had an excellent Italian dinner at Mamma Rosa, a very nice place, and then went to our hotel. The drive to Munich was without incidents. 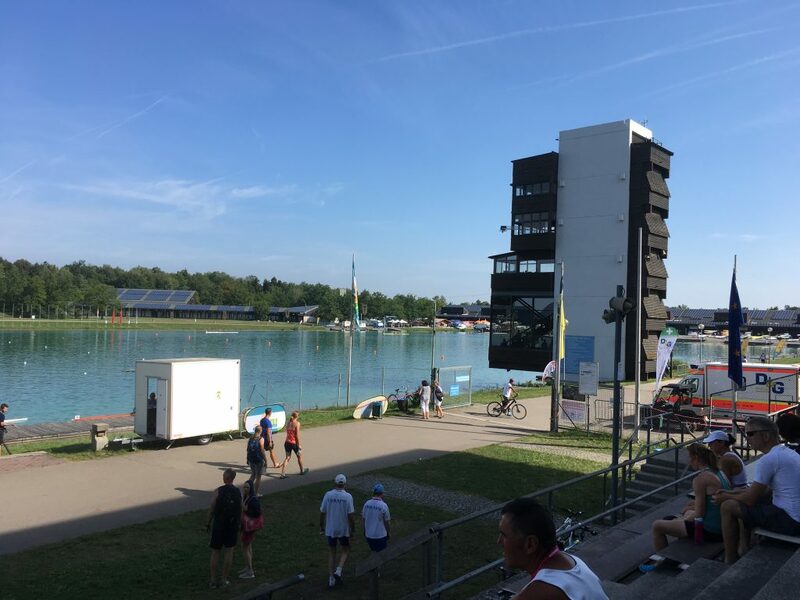 We left Brno around 9am and arrived at the regatta course at 3:15pm. The weather was nice and the site was bustling with activity. Romana went off to do her training in the quad and I went to the accreditation to get registered. Then I walked to the other side of the canal to see Daniela and Dave from Rowline. 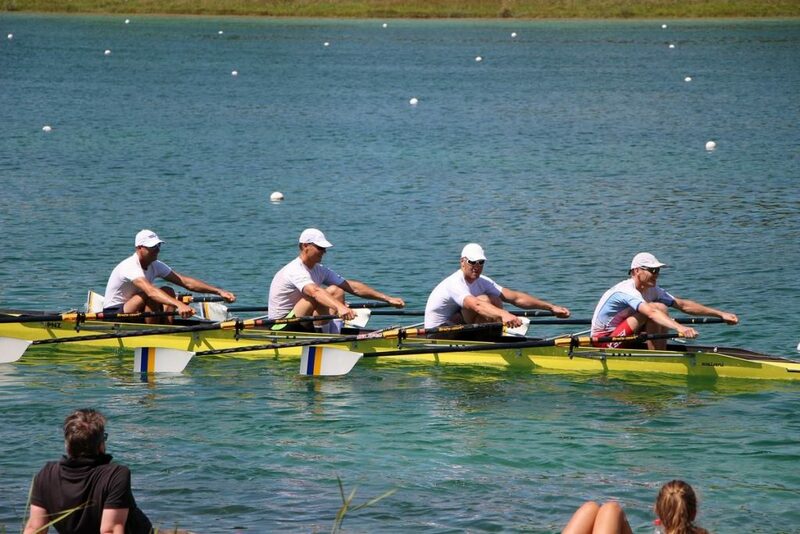 These guys from Prague were the official Concept2 reps at the regatta, but they also sell NK electronics. I picked up my pre-ordered NK SpeedCoach GPS 2 (and received a 20 seconds introduction on how to operate it) and then proceeded to prepare my single for a row. The row was a short one. 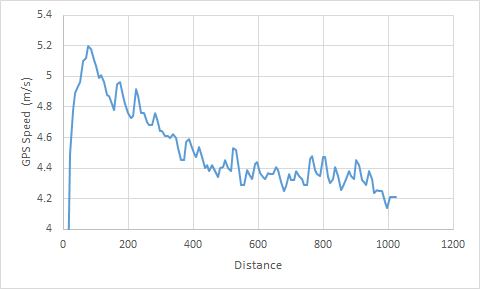 The plan was 3x250m at race pace, with 500m rest. 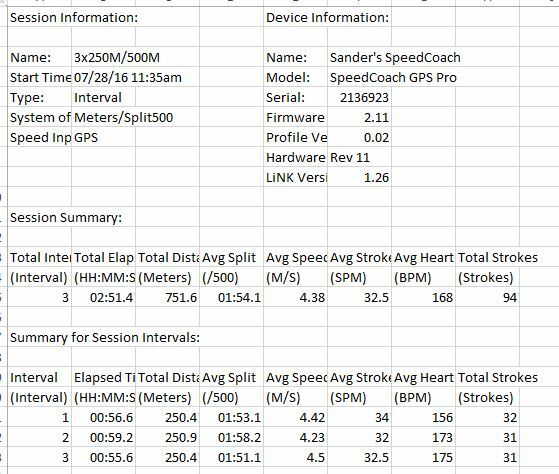 I did a 2k warming up which unfortunately wasn’t captured on the SpeedCoach, because I couldn’t find Just Row in the list of workouts. 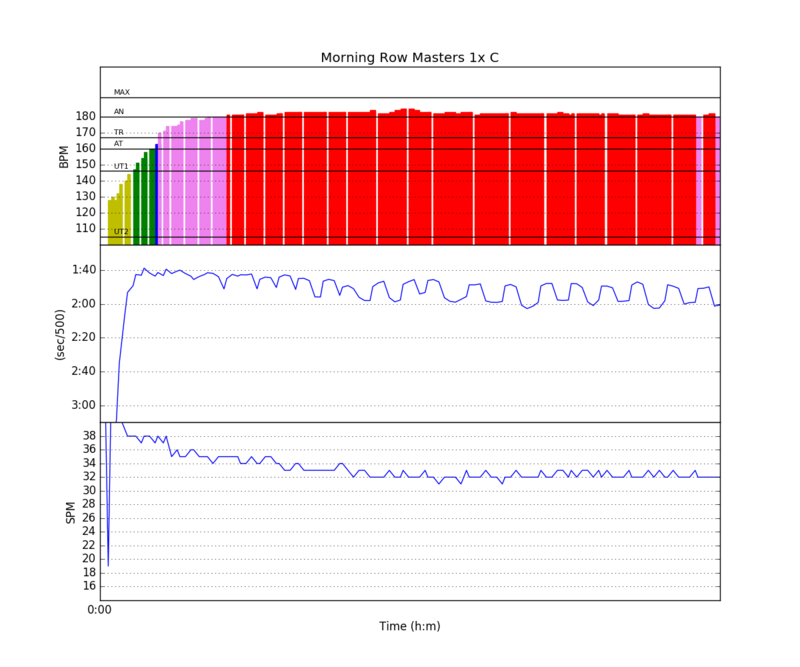 It turns out you just press the on/off button to get the device ready to record your Just Row and that’s all. This rugged piece of electronics with a simple monochrome display (which is excellent in sunny weather, by the way) works by pressing buttons, in contrast to CrewNerd where everything is done on your phone’s touch screen. I have to get used to that. At the 2km mark I turned and went into the workouts menu to program my 3x250m workout. That turned out to be pretty intuitive. I like that you can program rest in meters or seconds, whatever you want. I set a 10 seconds countdown, started the workout and waited to see what happened. 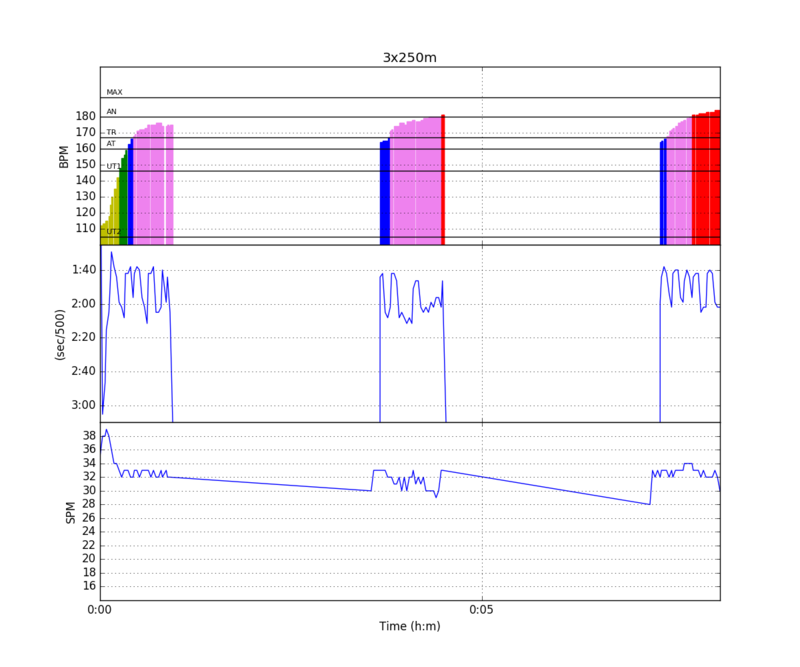 To be honest I did expect an audio signal at the workout start and end, which didn’t happen. I did the first 250m from a standing start, and looking down at a small screen doesn’t go with sitting in the ideal start position. I am not sure if the clock starts ticking after the end of the countdown or only when it registers your first stroke. Need to look into that. For now it seems that the countdown is more suited to pieces with running starts. Anyway, I successfully recorded this session. I also was able to look at the session details on the device itself. I liked that. 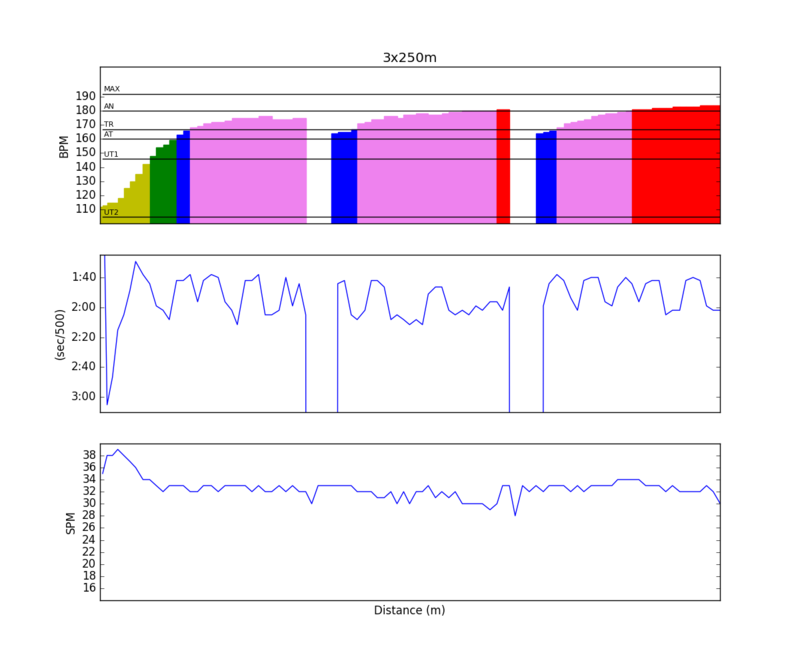 The graphs were made on rowsandall.com, after I exported the data from the SpeedCoach to a FIT file, which I could upload to Strava, which enabled me to import the data into rowsandall.com. There is something fishy about the data though, so I will need to look into that. The export of data works through LiNK, an application that runs on your computer. That is nice, but one doesn’t always have a computer at hand, and I think it would be good to be able to sync data to a tablet computer or smartphone directly from the device. Especially for self-tracking athletes, it is quite nice to be able to share workout data immediately through Strava or similar websites. 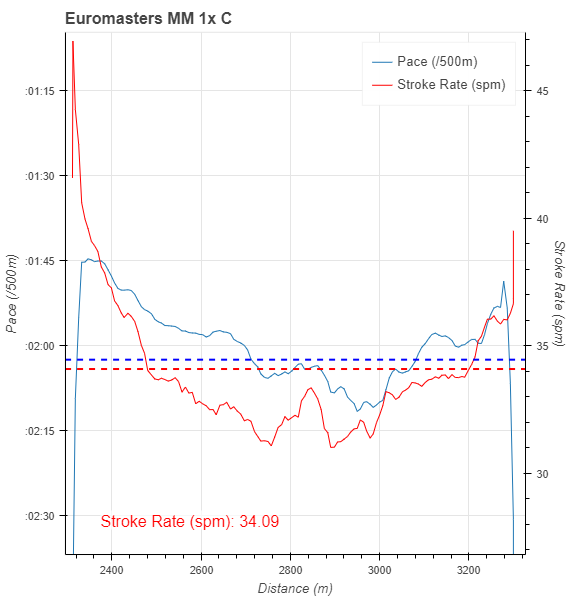 The CSV file export also has a stroke by stroke table with time, stroke rate, pace, and heart rate information. Rowsandall.com cannot yet process this CSV file but I will work on that. Should be straightforward. 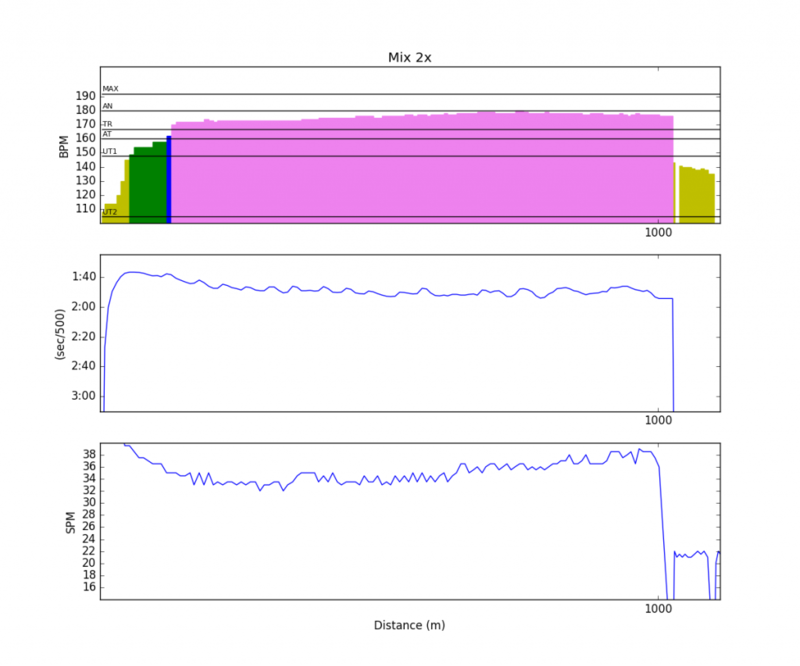 It’s a pity that GPS coordinate info is missing from that file, though. I will need to look into a way to upload the FIT file to rowsandall.com directly. I guess there is work to do to free the NK SpeedCoach data a bit more. After the row we went off to our hotel, had a dinner and then went bed. Friday – racing day. Tuesday and Wednesday: Too busy to do a training. Trying to get everything tied out at work before we leave to Munich. I managed to move a few meetings to the morning, creating a longer time gap to load the trailer. It turned out to be a good move. Lots of thunderstorms. We managed to get everything done without getting too wet but it took time. 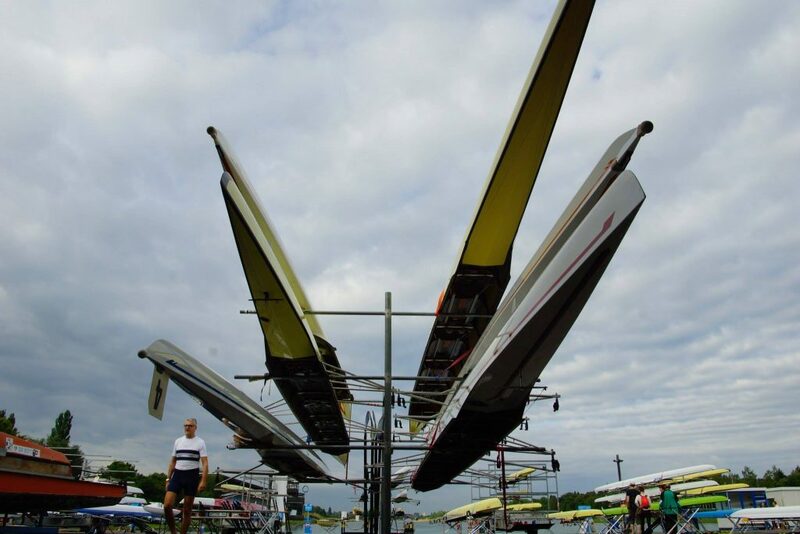 Four boats, 1 pair of oars, 5 pairs of sculls, two bicycles, riggers, wings and slings. And beautiful towels in the background. We are leaving tomorrow morning. There will be time for a training in the afternoon, although I will have to dial in to some teleconferences as well.